Even though I live in a tropical climate, I’m still a huge fan of hearty, warming soups. After all, I do work in an overly cold, air conditioned office all day long. But as much as love a good cream soup or chowder, I’ve been gravitating lately to soups that provide a wide range of textures and flavors. You know who does this really well? Southeast Asians. 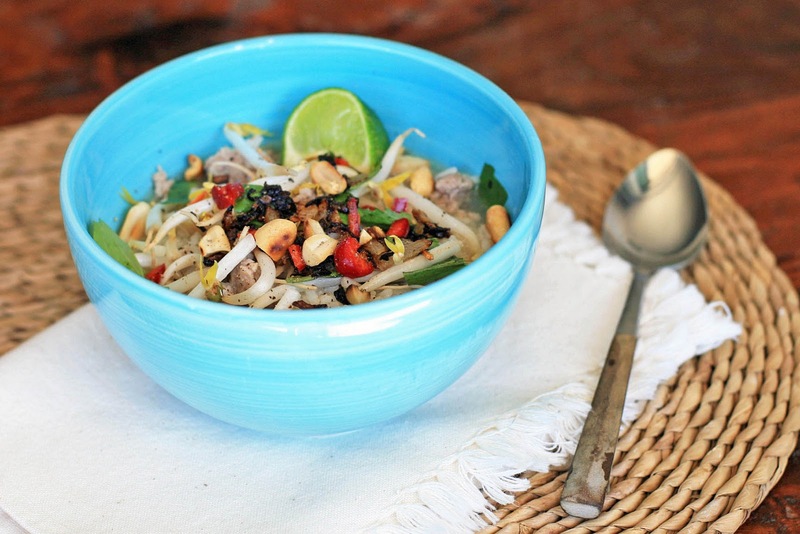 There’s just something magical about Thai, Vietnamese, Cambodian and Laotian food. This rice soup recipe is adapted from Jeffrey Alford and Naomi Duguid’s Hot Sour Salty Sweet. It, as you may have guessed, has all of those qualities. You’ve got heat from the chile pepper, lime juice adds the sour, fish sauce adds umami and saltiness, and the crispy shallots (and some palm sugar!) add a little bit of sweetness. 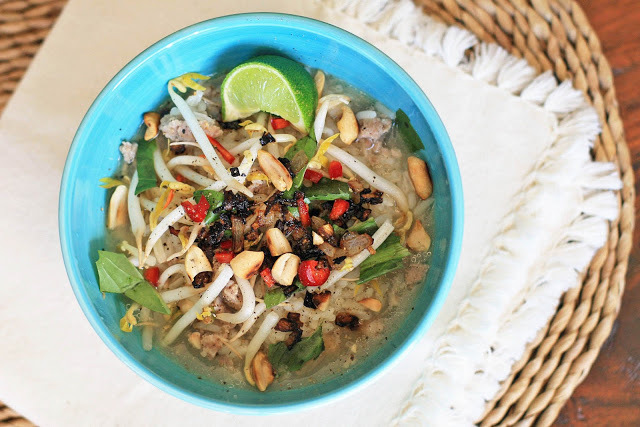 There’s a simple and hearty jook or congee-like base that gets jazzed up with the addition of chile, crunchy bean sprouts, toasted peanuts and fresh herbs. In a small bowl, mix the ground pork with the fish sauce and palm sugar and set aside. Place the water in a large saucepan over high heat and add the lemongrass, dried shrimp and ginger and bring to a boil. Let boil for 10 minutes and then add the rice, stir and return to a boil. Reduce heat low enough to maintain a slow, steady boil and let cook until the rice is tender, about 15 minutes. Remove from heat and discard the lemongrass and ginger. In the meantime, heat the oil in a heavy skillet over medium-high heat and add the garlic. Cook, stirring, until the garlic turns golden and then add the pork and cook, breaking up any clumps that form, until cooked through. Then add the contents to the rice soup. Next, prepare the garnish and accompaniments. In a small bowl, combine the fish sauce with the minced chile and set aside. Heat the oil in small saucepan and add the shallots over medium-high heat. Cook, stirring constantly, until crisp and golden. Place in a small bowl and set aside. Ladle some of the rice and pork soup into individual bowls. Top with herbs, some bean sprouts, some chopped scallions, the crispy shallots, freshly ground pepper and some chopped peanuts. Serve with the chile fish sauce and lime wedges.